When you run the thelostcrown-update1-1.exe file you downloaded, it automatically puts the single file contained in the patch, understudy.dcp, into a folder underneath where you installed The Lost Crown called: New Folder. If you just leave things like that, the patch *will not have been applied*. So what you need to do is manually copy that new understudy.dcp file over the top of the one in the folder where The Lost Crown is actually installed. Note that the patched file is actually smaller, at 295K, than the original file which weighs in at 380K. Objects that can be acquired by Nigel will be marked in bold at the place where you obtain them in inventory. Example: pick up the pencil. Be sure to examine every item that comes into your inventory. For instance, a business card might have a phone number on the back that you wouldn't know about otherwise. Be sure to talk to characters on all conversation topics that are presented, else you might miss important clues. 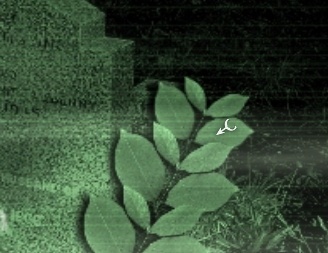 Likewise, examine *every* place in a scene that exhibits a magnifying glass icon when you roll your cursor over it. This game is full of obscure 'triggers', and if you haven't done everything it is possible to do, you may not be able to progress to the next time frame in the game. As with all adventure games, a lot of backtracking is required. Once you are sure that you've fully examined a particular location, you can double-click on the direction arrow to make Nigel move to the next location instantly instead of slowly trundling over there as he's wont to do. Nigel keeps a notebook of important events that occur, and it's also a to do list. You might have a glance at it once in a while if you're not sure what your next objectives are. You work as some sort of designer for a company called Hadden Industries. They seem to be conducting experiments to open a portal to another dimension. Mr. Hadden is the CEO of the company, and you were working with two other researchers nicknamed Mr. Crow and Mr. Hare. You downloaded some files concerning 'evidence', but your unauthorised actions were discovered and you had to leave the building via a fire escape. You then took a train from London to the first far-flung destination you could find, slept for most of the journey, and wound up in this godforsaken place called SedgeMarsh. A young lady boarded the train in London, and got off here too. If you examine your business card in inventory, you find your work phone number on the back. Walk back along the platform, and examine the pictures on the wall. You learn that there is a nearby town called Saxton. Also have a closer look at the barrels on the cart there. They appear to be an ale delivery from a brewery or distributor who market Bishop's Whisper and Fenland Ale, destined for a place called 'The Bear'. "Where does the path lead?" You soon arrive at a T junction. Have a look at the map there, then head off to the right. There is a man standing in a blind with a pair of binoculars, observing a heron out on the water. If you try to speak to him you just get told to shut it, so walk behind him and continue straight on the path which dead ends on the North Sea. You can pick up part of a rusty sign here. Then backtrack, and hang a right before you get to the birdwatcher. Continue on past a large stone with a rune symbol carved on it, go forward again, and as Nigel rounds the next bend, he pauses and observes someone in the reeds (it just might be our mysterious Lucy), and Nigel comments that he'll catch up to her later. Backtrack again, and make a left at the rock with the runes on it. You can see the top of a Martello tower from here, so head for it, then around it onto the Saxton path. Pick up the next part of a rusty sign here. Continuing along the path brings you to the entrance of a cave. If you examine the bit of sign hanging next to the entrance, it doesn't take much to figure out we have the makings of a 'Beware dangerous undercurrents & erosion' sign. Sure enough, if you continue along the path and pick up the third part of a rusty sign, you can then place the three pieces you've gathered so far onto the wall, and rotate the four pieces into place by holding down the left mouse button near each piece. Might as well ignore the dire warning and head into the cave now, eh? You bet! While you're here, note the carving of a sea monster on the wall. Now take the path just to the left of this carving, and read the newspaper page that's stuck in the iron gate that blocks your way. It would seem the spring tides are wreaking havoc with the local graveyard as well. 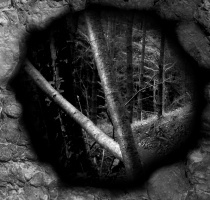 If you click on the top of the gate, you get a close-up of beyond the gate, where you can see spectral forms scurrying to and fro. When you're finished there, go back and head out the other entrance of the cave. You see a boy in the distance trying to fish his teddy bear out of the sea, but you can't interact with him yet. Continue onwards, and chat with the woman standing with her dog on the beach. Now it starts to get creepy. When you mention that your name is Nigel, she knows that your last name is Danvers. They've been expecting you! Come to think of it, it seems the Station Master knew who you were as well. And you could swear you never told him. When you enquire about bed and board, the woman recommends The Bear. When you've finished conversing with her, head back to where you spotted the boy, and he's gone now - allowing you access to the path he was blocking with his tricycle. You come upon another cave entrance here, but Nigel refuses to proceed too far into the cave as he can't see anything. Exit the cave, continue up the beach, and you can now take some stairs up into the town. Once inside The Bear, examine the fireplace and you'll find a cat sitting on a chair in front of the fire. Go on, have a pet. Head through the doorway marked Toilets, go down the hall, and note the grandfather clock that's stuck at 9:00. Examine the folding partition, and take a Saxton Snappers leaflet. Speak to the woman behind the bar about renting a room (you also get a bottle of water). She says the hotel is full, but offers you a cottage near the harbour (it's actually just past where the journalist is standing), hands you the Harbour Cottage keys, and a map of the town (note: the map comes in *really* handy from now on. Be sure to peruse it carefully at the first opportunity, in order to orient yourself). If you ask about a phone, you'll be directed to a pay phone "across the harbour, over the bridge and up Station Lane". Leave once you've exhausted the myriad of conversational opportunities presented here :- Oh well, at least we have another place to explore. So head for the Harbour Cottage and... as you approach the cottage (once you have the keys) an obnoxious man who turns out to be the Professor Hardacre you read about in the newspaper article calls you over and gives you a right dressing down. Once that's over with, you can enter the cottage. What a dive! It looks like the place has been deserted for countless years, and you'll soon discover... that it has. Pick up the phone. It's been disconnected. Then head down the hallway, and enter the kitchen. In a drawer to the right, you find some estate agent's papers. This was once the home of Eduardo Molina, who arrived here from Spain in the 1950's. Some tragedy occurred shortly thereafter, and the place lay abandoned for 30 years only to be put up for an auction (that never happened) in 1988, and that was presumably 20 years ago. There's also a boarded-up doorway at the end of the room, but Nigel observes that no one's been there for decades and makes nothing else of it. When you leave the kitchen and head for the sitting room again, you hear glass shattering. Return to the kitchen, and you'll see that a plate has fallen from the cabinet, exposing a book. Strangely, there are only two pages in what turns out to be Eduardo Molina's diary, and they only elaborate a bit on what you already learned from the estate agent's papers. Eduardo's wife Christina arrived from Spain to join him in 1952, then promptly fell ill, and most probably died shortly thereafter. 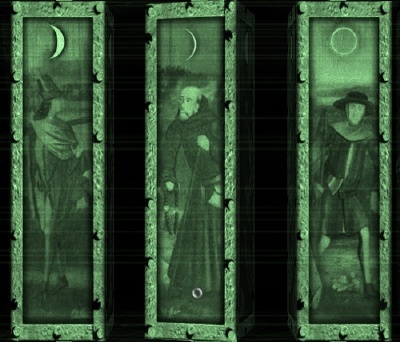 Go to the end of the hall next and examine the wall there. Nigel comments: "There's something about this wall... something not quite right." Now head back through the sitting room and go upstairs. There's also not much you can do in the bedroom for the moment except examine the wardrobe. Nigel decides it's a good spot to hide the artefacts he collected from Hadden Industries, and pins them up there. You can try to rest in the bed, but Nigel says he's not finished investigating yet. Hmm. Now this one had me puzzled for quite a while. As alluded to earlier, the game is full of 'triggers' and artificial blocking devices (no doubt you've noticed that the way over the bridge is currently blocked by some boats in the street, because Jonathan doesn't want you to go there yet. That was also the case with the boy and his tricycle, etc.) So... what haven't we done yet? Turns out that you need to examine the sink in the bathroom, which results in Nigel looking in the mirror and creeping himself out. Then the next time you go upstairs, Nigel hears a strange noise. Enter the bedroom, and you hear what sounds like a cat trying to escape from the chest at the base of the bed. But it's locked. Examine the stag's head above the bed, and hey presto, you obtain a small metal key. Now you can open the chest, only there's nothing there except a few sandbags. But... you have triggered the end of Day One, and Nigel can finally use the bed! Nigel sleeps fitfully, and awakes to the sound of knocking. Head downstairs, and Nigel discovers a note from Morgan, the landlady at The Bear. Since there's no electricity (in most of the cottage), she's put some candles around the place. She also left you a Saxton Snappers leaflet (in case you didn't already pick one up in the back room of The Bear). Enter the bathroom, turn on the light, and... an old clothes dummy has somehow appeared in the corner. Anyway, you still hear knocking, so go to the front door. When you go outside, there's nobody at the door. But head to the right, and follow the person you spot out onto the harbour wall. It's Professor Hardacre. He tries to persuade you to leave Saxton, but of course, Nigel's not having any of that. Question him, and all that you learn is that the cottage is apparently haunted, but you already figured that out. After Hardacre leaves, head back towards the cottage, and as you pass The Bear, Nigel spots something on the barrel there. It's a personal digital assistant. By accessing the device menu, you learn that the person it belongs to (Alex Spitmoor?) is following you. You can't take the device though. Now head into The Bear. As you approach the back room, Nigel hears voices. But when you go to investigate, no one is there. Exit The Bear, and head back towards the cottage. Speak to the man up on a ladder who is putting up buntings for May Day. Again, you learn nothing useful as a result of this conversation. Once you're done speaking to him, take the path to the right (there should be a cat sitting on a box there). Hey, now the boats are no longer blocking the path and you can explore the rest of the village. Nigel remarks that you should go find that phone and call Hadden. Don't bother calling either Cat Watch or Alex Spitmoor yet, as it's not the right time for either. You also can't continue further down the coast path at this point in time... but if you wait by the phone box, a light will eventually come on in the window beside it. You can then look in the window where you spot a typewriter. Don't think that's significant though. Go back to the cottage now, turn on the light in the bathroom. Whoa. Examine the clothes dummy if you haven't already, then examine the mirror and use the bottle of water on it. The face of a beautiful woman comes into focus. I'm betting that's Molina's wife, Christina. But she doesn't respond to Nigel's questions, and the image eventually dissolves. Now look in the bathtub, and there's a lot of hair in it (note: you'll only be able to see the hair if you applied the version 1.1. patch. But this has no bearing on the game play anyway, as you can't actually do anything with the hair). Exit the bathroom and go to the end of the hall. You can now see the outline of a door under the wallpaper and panelling. Upon examining it, Nigel comments: "Urgh. The air smells rank, like rotten flesh." But you can't do anything with the doorway yet. Examine the inverted cup on the table in the sitting room. Hmm. It seems we can conduct a séance. The cup moves in response to your questions, and seems to indicate there is a spirit trapped in the cottage, and that you can somehow help to set it free. Once you've done that, you can end Night One by accessing the bed upstairs. Nigel dreams of some weird folk with scythes... and that's that. An anonymous letter that says: "With blood on your hands you will come to me. With pain in your heart you will set them free." Well... let's go outside now and mingle further with the locals. Go down the stairs and walk along the beach by the boats. A strange man by the name of Doctor Black is painting a picture of the harbour there. 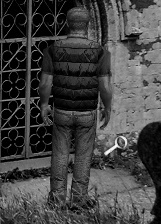 If you examine the painting, you'll see he's added a figure there (near the old net store, according to your map). He won't speak to you. Perhaps he doesn't speak English? Head to the antiques shop (use your map if you don't know where it is yet). There's a book on display in the window with three crowns on the cover. Nigel comments: "Three crowns. A link to the legend." For some strange reason though, you can't enter the shop. So head down the alley and into the train station. There's a boy there taking photos of the pictures on the wall, but you can't talk to him (it turns out that he's the 'competition' for the annual Saxton Snappers contest) . You can, however, speak to the man behind the ticket counter. In fact, it's none other than our old friend, the Station Master! You learn of a horrible train wreck in the 20's that involved his father, and of how all the poor souls on the train died that night. Behind the drain pipe next to the cottage door you find a note from Lucy. She was a bit short with you last night, but she's come around now. In fact, she's sitting on a bench right next to the cottage. You learn that Hardacre is in the caverns behind the beach. After speaking with Lucy, head for the caverns. Hmm. We need to find a place to try out these shiny, new gadgets. Hey, how about the cave on the path to Saxton where we saw the ghostly figures beyond the gate? Sure enough, the digital camera, dictaphone, and EMF meter all produce results when used on the top of the gate. You wind up with a photo of a cavern ghost, and a recording of cavern voices. You can also go back to the fens and get a photo of a frog, though I'd surmise that has more to do with the Saxton Snappers competition than our ghost hunting efforts. Now head back to the cottage. You can take a photo of the covered doorway at the end of the hall. In the sitting room, you'll note that you can also interact with the armchair. Indeed, you can take an armchair photo, and also get an armchair voice recording. Finally, go to the bathroom, focus on the mirror, and get a nice photo of Christina... and also a photo of the bathtub. On the way back upstairs, take note of the windmill carving on the baluster at the base of the stairs. Now if you go upstairs and examine the table, Nigel will deposit all the evidence you have gathered so far in either the photo album, or the bin of tapes. OK then... now I think we're ready for a ghost-busting extravaganza. Well, at least as much as we can muster for mid-day! Go to the caverns, and head past Professor Hardacre. Remember that we couldn't go any further into the caverns because we didn't have a light source? 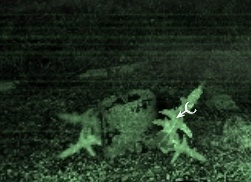 Aha, but now we have a camcorder with 'night vision' ;-) So point that sucker at the dark place, then head forward until you can look to the left and see some wood. Examine the pieces of wood there, and pick up a plank of wood. Then back out of that scene, and head forward again until you come to a fork. Take the left-hand opening first, and advance towards the shaft of light until you get to spook city. You can have a one way conversation here. Then there's a recording opportunity, whereby you obtain a recording from the tidal chamber, and a photo from the tidal chamber. So now you can finally enter the antiques shop in town. Once inside Nigel comments "Now, let's try to find a link to Spivey, the smuggler." If you work your way to the back of the shop, you'll eventually encounter a man playing with a doll. In fact, he's so pre-occupied with the doll that he doesn't notice when you nick the book with three crowns on the cover from right under his nose. You can try speaking to him, but it's a futile exercise. He speaks through the doll and all you can make out it is "I'm Jemima." So exit the shop then and examine the book. Darn, the thing is locked! Hmm. I wonder who would have the key, or know how to open it? Wait... Bob Tawny is a smith, right? So take the book to him and he says he'll open it for you in the afternoon. As you leave the smithy, a cat walks past and goes down the coast path (the part that you couldn't visit yet). Nigel follows it and arrives at the Celtic Corner. The new ager behind the counter is Rhys, the guy that runs the Saxton Snappers competition. Indeed you can deposit your photo of a frog in the box at the rear of the shop. Then speak to Rhys. After speaking to him, be sure to peruse the bookshelf near the shop entrance. The most interesting read is volume 3 of Unknown Anglia. It tells the tale of a ghost ship, the failed invasion from whence it came, and it involves the infamous Walter Spivey. At the very end you get a good summation of the Three Lost Crowns legend. The middle books on the shelf contain a catalogue of Anglo-Saxon symbols, along with an explanation of how they can be rotated to mean different things concerning the objects depicted. Worth taking note of. I have the feeling we might need to do some symbol translations later on. When you're done with the bookshelf, exit the Celtic Corner. Outside the shop in some boxes, there are two interesting books you can look at. One is basically Everything You Always Wanted to Know About Yew Trees But Were Afraid to Ask. 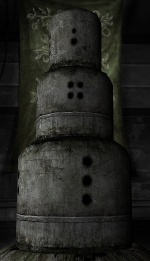 The other is a thinly (though one might also say cleverly) disguised advert for the Dark Fall and Barrow Hill games. Sure enough, you can now walk down along the tracks by the 'Beware of the Trains' sign. You soon come to a signal that is behaving strangely indeed. You can take a photo of the railway signal. Then continue onwards and you arrive at a place where a small footbridge leaves the tracks. Examine the woods there to get Nigel off the tracks, and now you can continue down the path to the west to arrive at... Raven Lane! 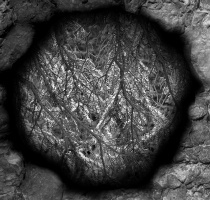 Upon examining it, Nigel comments "The patterned stone is heavily cracked, probably frost damage." Yes, our initial guess was correct - the symbol above does correspond to winter. Open the Karswell Cook Book (on the left side of this close-up), and you are presented with the menu du jour: Seven Birds Stew. Read the note under the book, and you learn that winter was the first season in the Dark Ages, not the last. This will be an important fact to remember for later on! Now go back outside, and head to the right. You come upon Robert in his workshop. He's very intent on something and also agitated, so you won't be able to engage him in conversation just yet. Nigel comments that "The pattern has been bleached by the summer sun." Well, that pretty much confirms our suspicion that this symbol must represent the summer season. Now go back outside and collect the hedgerow balm from the centre of the hedgerow on the lane. You can add this directly to the pot without chopping it first (it's taking the place of the bay leaves in the original recipe). Now Katherine prepares the stew while you put your feet up. Several hours later... having consumed the stew, Katherine has fallen asleep in the kitchen. Time to pay another visit to Robert's workshop then, now that he's presumably calmed down. Indeed he has. Now you can speak to him, then carefully examine his work table. You must read all four scrolls (one of them is a map of the woods), then pick up the bundle of sturdy oak sticks (if you haven't read all the scrolls, you won't know what to do with the oak sticks). Now head back to Monolith #1. 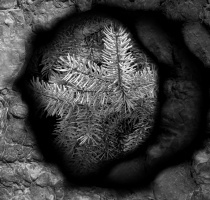 Use the oak sticks on it, then rotate the monolith till you get to the winter symbol. 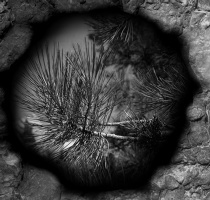 When you gaze through the hole at the top, you'll now see another monolith. I think we're finally getting somewhere ;-) Go to Monolith #2 and rotate it to the spring symbol, then to Monolith #3 and rotate it to the summer symbol. Now when you return to Monolith #1 and look through it... bingo, you see the tower of Northfield Church! Nigel marks the church location on his map, and now you can go there (of course, it's on the path through the woods that Nigel wouldn't take previously). Nigel comments that it would be most fruitful to come ghost hunting here at night, but we can also accomplish some things during the day as it turns out. So head to the left of the church and you discover the grave of William Ager. Note the three crowns on his headstone. Continue heading left, and enter the church through the iron door. You can read the notices on the bulletin board. I didn't find much of interest there, except that we should look for a Mr. Russet somewhere in the grounds, and that the vicar can be found in the vestry during daytime hours. When you enter the church proper, you'll see a small table just inside the door. You can place your camera on this table (it's motion sensing, remember). Behind this table is a bookshelf, where you can read how the Black Death decimated this part of Anglia in 1348. Then work your way into the church until you come to a partitioned-off area. Examine the partition, and you get a close-up of some records with names of the former rectors and vicars that are interred here. You can obtain a rood screen voice recording here. Then use your camcorder on the names, and you acquire a new clue: the name Thomas Ager stands out among the rest. Then enter the partitioned-off area (which turns out to be the church's sanctuary). Among other things, it contains a tomb with a statue on it. You can get a Sanctuary voice recording off the large wall plaque above the tomb. The voice in it quite clearly says: "Ager, Ager... he took my hands." Yikes! Examine the statue next, and Nigel notes that it indeed has no hands. Pull out of the close-up and use your camcorder on the statue. Nigel spots some 'orb activity'. Perhaps this place will be even better to visit at night though? Also have a look at the row of small plaques on the shelf there. If you examine the first one carefully, Nigel notes that there is another church that he doesn't recognise depicted on the top left-hand side of the plaque. Now head southwest to move further away from the tomb, and you can get a close-up of the base of the tomb. The panels there probably used to have ornate carvings in them, but they have somehow been worn smooth. There's also another coat of arms carved into a pew here. Continue on to the choir stalls. From here you can interact with the pews in the centre of the church. 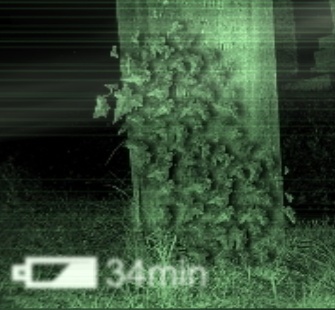 You can use the camcorder to see a ghost walking about. He even passes right in front of you if you wait long enough. And oh is that ghost ugly! You can also get a recording from the church pews here. Then make a left into the vestry to meet the vicar. Before speaking to him, examine the tapestry with three crowns to his right. Also check out the portrait high up the wall with your camcorder. Nigel feels there's something about the eyes. Speak to the vicar now. He's lost something that he wants you to find for him. But he doesn't know what it is, or where he last had it... though he thinks he lost it sometime between Wednesday and Friday. Hmm. We'll have to keep our eyes peeled for anything that might belong to the vicar. Wait, I know... exit the church and examine the notice on the bulletin board concerning the memorial service for Evelyn Ackland. The vicar somehow managed to lose next Thursday! 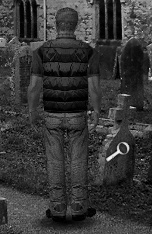 You've now acquired a memorial service notice in inventory. Go speak to him again, and he wants you to take the notice to Nanny Noah, so she can organise flowers for the service. You can learn a little more by speaking further with the vicar. Thomas Ager, a former rector, came into a lot of wealth (by mysterious means) shortly before he died. His descendant, the ubiquitous William Ager, was thought to have taken an important secret to the grave. We're betting it's the secret of where the Lost Crown is buried, eh? 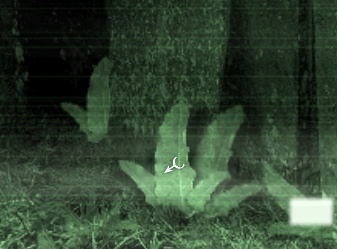 Sometime during the course of these investigations you hear the camera you placed on the table trigger in the distance. Go back to it, and collect a photo of a church ghost. OK, I think we're finished with our investigation of the church interior for the moment. Before we do anything else, let's lighten our inventory a bit by getting rid of some of this junk we've been collecting. So go to the Celtic Corner and deposit the photo of a heron in the competition box. Then return to the cottage, head up the stairs and look at the ceiling there. You get another photo opportunity. This time you capture a photo of the cottage skylight. Access the table in the bedroom to add all the paranormal stuff you acquired today to your mounting evidence collection. Now head for the museum. At the museum entrance, examine the counter to obtain a map of the exhibits. Speak to the curator, Professor Oogle. Hmm. I guess we won't be coming back here later to ghost hunt... unless we can find a way to sneak in. Anyway, let's go in, shall we? The area numbers and letters below correspond to those on your map. Only a picture of Northfield in 1602 here. Move northeast to Area 2. Actually, it's behind you. Read about Saxton's famous purported treasure, and... you can take a photo of the Saxton area map because there is no surveillance camera in range here ;-) Hmm. I see one new location on the map, a war memorial past the lighthouse. Move west again to Area 3 next. Here you learn that an Emily Travers perished in the caverns. Only her shattered eyeglasses were ever found. You also learn that Eduardo Molina committed suicide (no doubt due to the tragic death of his wife, Christina). When finished here, move northeast to Area 5. Nothing to see here, so move into Area 4 (the library). Fortunately, there are only two books that you can read here. The first one (book with bluish cover) is entitled Olden families of Anglia. It documents the Russets (our gravedigger's family), the Agers, and the Gurneys. You don't learn much about these families that you haven't either learned or surmised already, but now we start to hear more about Ulcombe, a town beyond Saxton. The other book of interest here, with the green cover, is a duplicate of the one we came upon in the Celtic Corner - a catalogue of Anglo-Saxon symbols. When finished in the library, exit, and move northwest to Areas 6, D, and E (the butterfly room). The door to the room you saw through the fan grating is here, but it's locked. When Nigel knocks on the door though, you can hear something bumping around inside. Might as well have a look at the butterflies, Spivey's scope, the battle helmet, and also the hand activated video recording. It shows footage of Northfield Church, and also what can only be Ulcombe Church (overlooking the North Sea). From here, you can go northwest to pop into the video room and watch some of Jonathan Boakes' home movies of Saxton... but you won't learn anything from that, so head west to Area 7 instead. You can obtain an eerie recording of the museum's noose exhibit here, whereby you can delight to the sounds of Molina hanging himself. No other exhibits of interest here, so move northeast towards the suit of armour next. You can press the button here to summons the lift. Once on board, just for curiosity's sake, press 0 first to go to the basement. But it doesn't look like you can do anything useful here, so get back in the lift and press 2 next. The second floor is primarily an art gallery. At the very end of the hall, you can capture some strange sounds recorded from the painting, 'Tree of Crows'. There's another hand-activated video there which largely seems to deal with aspects of the occult. But exactly what it's trying to depict I cannot tell. As you pull away from these final exhibits, you get a message over the tannoy that the museum will be closing in 10 minutes. I guess we've seen all we're meant to see then, so head for the exit (I tried heading for the basement after the announcement, to see if I could wait the 10 minutes out and get locked in for the night, but this doesn't seem possible). On the way back down the alley towards town, you hear George barking. You can go left into Nanny Noah's house now. Try to speak to Nanny Noah, but this just prompts her to make tea. Once you and Nanny are seated, speak to her on all topics. She gives you a charm when you mention that you are going to visit the church again this night. Present her with the memorial service notice then (you have a dialogue option to show her items). After that, she reads your palm. Then the moon rises and Nigel returns to the cottage. Access the bed to get a few hours kip before setting out for the night's ghost-hunting. Nigel discovers a set of shears under the covers. Has someone been here? I suppose we can do some more hunting in the cottage, prior to setting out for Carrion Wood. As you head downstairs, Nigel hears a rattling sound. Investigation reveals it's the bathroom door. Nigel won't enter until he knows who, or what, is in there. 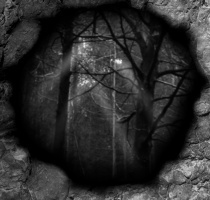 You can look through the keyhole, only to see a dark shape pass right before your eyes! 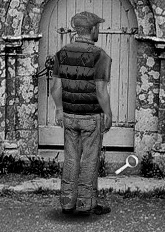 Now Nigel will let you open the door and head inside... as you turn on the light, you notice that the clothes dummy has reappeared in the corner. And there's something in the sink. But when you go to investigate, the light suddenly goes out. You hear strange noises, then the light comes on again, but whatever was in the sink has disappeared :- You can take a photo of the mirror, but this time you just get a ghostly image of Nigel. Use the camcorder to so you can see the dark part of the room. You can zoom in on a picture of a train, and see ghostly figures on the platform. Then take a photo of the same area to obtain a photo of the station staff. Ghostly images appear among the people in the photo. You can also get a bizarre recording, from the station staff photo. Well, that's all for here. Go back to the cottage to deposit your latest evidence, then head for The Bear. OK, I suppose we can head for Northfield Church now... on the way there, when you reach the faulty junction signal, Nigel is attacked by spirits from an oozing, black cloud. Use the charm Nanny Noah gave you to deflect the spirits as they emerge from the cloud. Once you've done this successfully a number of times, the cloud will dissipate and you may continue onwards. Make your way off the tracks and to the church. 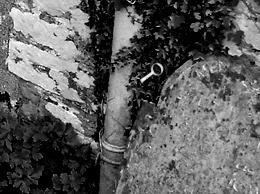 Once you reach the churchyard, you'll need to use the camcorder to see. It's quite difficult to navigate through the tombstones, but try to keep heading for the outline of the church, then work your way around it, and eventually you'll find that Russet has indeed left the door open for you. Once inside, examine the small table near the door. 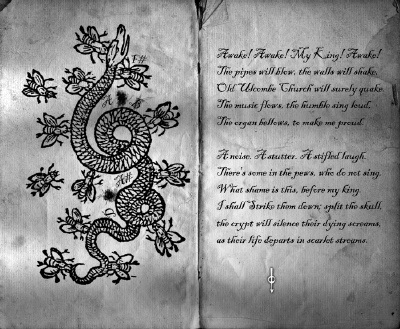 Read the note that Russet has left under the Hedge Witch Tome there, and then read the tome. Hmm. Looks like you need to construct a pentagram with special varieties of leaves around one of these wraiths in order to vanquish it. But where are we to find these leaves? Well... we need to go back outside and hunt around in the churchyard for them ;-) First, a handy tip: if you're navigating around using my instructions below, then be sure to save the game right after you pick each leaf variety; otherwise, you may get lost without a point of reference to restore to! Now we can go back inside the church and resume our ghost hunting (before you dispersed the wraith, your path through the church interior was blocked in all directions). But before we do that... head behind the church once again, and examine the rubbish heap near the drainpipe. The wraith was preventing you from doing this earlier, but now you can pick up a pair of stony, cold hands. Gurney's, of course! Ok, into the church again. Near Gurney's tomb, on the end of a pew, you can take a photo of a coat of arms from the pew. Also, examine the stone slate above Gurney's tomb, and you can also take a photo of a coat of arms from stone slate. On the archway above the sanctuary entrance, you can get a photo of archway coat of arms. Now use the camcorder on Gurney's tomb. Whoa! Gurney is saying: "He took my hands, they took my arms." Aha. It must be *coats of* arms Gurney is referring to! Next, you can get a close-up of the statue, then replace Gurney's hands. Finally, get a close-up of the base of the statue, and place the three coat of arms photos you just took on their corresponding places. Now when you use the camcorder on Gurney's statue once more, he's singing a different tune: "With oil and hair I captured the crows. Seek the tree." As Nigel mulls this over, he mentions a painting. Yes! Gurney must be referring to the painting of the crows in the museum's gallery ;-) Nigel heads back to town now. Hmm. It appears from reading Nigel's latest notes that there must be a way to break into the museum. So head for there. Next to Nanny Noah's front door you'll find a garden spade. Use it to prise open the lit window on the side of the museum, and we're in. Head for the washroom first. In a bin there, you find a newspaper. Hmm. The Karswells you visited at Ager House earlier have actually been dead for 20 years! But how could that be? "Is there anyone here?" Two taps. Yes. "Am I alone in this place?" One tap. No. "Can you see me?" Two taps. Yes. "Are you trapped in this place?" Strangely... one tap. No. You can get a photo of Molina's noose now. Next, have a look through the fan vent into the hidden room. Nigel hears someone there. It's Lucy, ostensibly searching for cats! After a bit of a chat, Lucy reluctantly agrees to join forces with Nigel, and he hands her the EMF meter. But Lucy seems content to stay on her own for the time being. So... head for the hidden room first. Move the painting on the floor, and it reveals a floor plan of the old net store. Nigel wonders what Lucy was really doing in here. More interestingly, the filing cabinet on the left-hand side of the room will slide over to reveal a hidden passage! Before you enter though, head back out and speak to Lucy. You ask if she has a mobile phone, because that will affect the reliability of the EMF meter. She assures you that she doesn't have one. OK then... enter the passage, then head around to the left. In a box on the floor there you discover some newspaper clippings that tell of how a young girl named Verity Church became trapped in this very building and died. Indeed, as you pull out of the close-up, Verity's ghost appears behind you. Of course, that's the ghost you saw earlier in the basement. There are also some peepholes in the wall here. You can observe a ghostly figure walking by one of them. On the other side of the passage is another room with peepholes. Also, you can examine a set of pipes in the corner. Nigel observes "They must lead... somewhere." As you go to exit the passage, Nigel hears a mobile phone ring. Peering through one of the peepholes, you can see Lucy talking to someone on the mobile phone that she supposedly doesn't have! She arranges to meet the person later on at the Martello tower. Aha. So, Lucy *is* following you. Now you can go use your camcorder on the Saxton Skeleton, and also obtain a photo of the Saxton Skeleton. The exhibit cases here require a key, which I never found. You can also get a photo of the battle helm. I think we're done on this floor, so take the lift to the second floor... but as the lift approaches the second floor, a ghostly hand reaches out and sends you back to the first floor! Hmm. We must find out why Verity doesn't want you to go up there. So go back to the washroom, and use the camcorder on the mirror to summons Verity again. This time, she speaks. And it appears that William Ager, or his ghost, is after you. She fears for your safety. After the conversation ends, exit the washroom and head for the monitor room once more. Now you can see what must be William's ghost in several of the monitor views. Yikes! But now that Verity has had her little chat with you, you can take the lift to the second floor. When you use the camcorder on the Tree of Crows painting... well, I shan't ruin the surprise ;-) Then use the camera on the painting to get a photo of an Anglo-Saxon symbol. Nigel then decides it's time to leave the museum. He gets in a huff with Lucy because she's still not a 'believer' after all that, and storms off back to the cottage. Upon entering, Nigel hears a noise. Further investigation reveals that some more entries have been made in Molina's diary! Hmm. Doctor Black, our painter on the beach, gets a mention. Funny, he didn't look old enough to have been a doctor... what, 55-odd years ago? Anyway, sounds like Christina's days were numbered at that point. Now head upstairs and deposit your latest evidence on the table. Then go back downstairs, and someone is knocking at the door. It's Lucy. After she agrees to help you, you can now access the monitoring equipment on the sitting room table. Lucy goes to place the cameras, while you operate the equipment. 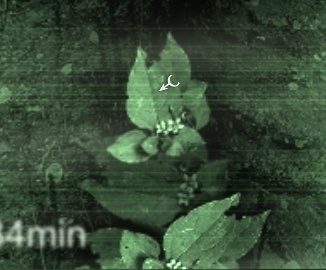 First, log into the Environmeter by clicking on the red and green flashing box on the initial screen, then click the little green box on the monitor for camera #1. Now... you have to keep helping Lucy to adjust the transmitter for each camera so that the scene comes into focus. It seems a bit arduous at first, but really all you need do is find the right spot inside the 3 x 3 grid to get the soft focus right, and then the right spot inside the next 3 x 3 grid for the finer focus. Once you've triggered all the necessary events, in any order, Nigel and Lucy go have a chat outside. She's still not convinced that any paranormal events have occurred, but agrees to meet up with you tomorrow nonetheless. Nigel heads upstairs then. Firstly, deposit all your equipment on the window sill. Then you can bring an end to Night Two by accessing the bed. Go to the window sill to collect your gadgets, and it looks like the dictaphone and EMF meter are missing. But the camera has captured a photo of a wardrobe ghost. Go downstairs, and Nigel finds more items that have been stuffed through the mail slot. The first is a copy of the Saxton Times, detailing your exploits at the museum last night. The other item is another threatening letter. This one says "Too late 4 Gurney, Travers, and Danvers. Known to some, with some being few, the Nightmare Room is waiting for you." Charming. As you try to leave the cottage, Nigel says we must find the missing gadgets first. The EMF meter is in the bathtub. The dictaphone is in a drawer in the kitchen. Nanny Noah is standing on the pier near the cottage as you exit. She says she saw Lucy heading for the coast path. Strange. How would she know that information is important to you? Anyway, following Lucy is one of our prime objectives for the day, so might as well go with the flow. So head for the coast path then. Pop into the Celtic Corner on the way. A few things to do in there. As you enter, Nigel goes to speak with Rhys, who's quite upset. Seems like the catnappers have taken his Mr. Tibbs. You promise to keep an eye peeled. Then pop your latest (publishable) photo, of the battle helmet, into the competition box, and access the catalogue of Anglo-Saxon symbols on the bookshelf. 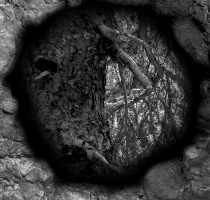 Use the photo of the Tree of Crows on the book, and you discover that this photo has the symbol for town/village running through it. Head as far as you can go on the coast path now. No sign of Lucy, but if you go as far as you can, you can take a photo of pink flowers (that Nigel can't identify). Now go to the museum, and talk to the curator. Another (perhaps) useful titbit of information comes your way. It seems the Carrion Woods have abandoned mines in them. Then enter the museum and... Lucy isn't in there either. Then why was Nanny Noah telling me that she was on the coast path? So I suppose we ought to head for the fens next, to see if Lucy is going to keep her appointment with whoever. On the way there, you can stop into Saxton Station and pick up a map of Saxton and local area. Then head for the fens. You spot Lucy and the person she had a rendezvous with atop the Martello tower. You can walk around to the other side of the tower and then examine it to eavesdrop... a bit. You can only see the eyes of the other person, but from that and the view you had earlier from behind, it looks like our old friend Alex Spitmoor. Well, you already knew he was following you. You can only hear Lucy's side of the conversation, and she's saying stuff like: "It's not him. ", from which you take it to mean that you're not exactly who Spitmoor thinks you are. The conversation ends quickly, and you can hear the footsteps of the two of them descending the tower. But there's no trace of anyone when you head back to the other side. So just head back for town then. Clackety, clackety, clackety clack. Rolling, rolling, down the track. Seek the Staff of ages past." Through the backstreet, to an old town hall. The clerks have gone, leaving poor little flutter-by's, who flutter no more." Up the hill, and out of sight, you'll find our savior shining bright. Beware the false torch, from centuries past and seek Saxton's true light to save your soul." Hmm. The lighthouse? Yep. And Lucy is there. She hands you a walkie-talkie, and tells you to, like, keep in touch. Important note concerning the walkie-talkie: there is a section coming up in a while where, if you haven't patched the game to version 1.1, when you try to use the walkie-talkie you will be thrown back to an earlier scene, losing some of your progress. You can apply the patch at any time, as it's only a data file and doesn't affect your saved games or anything. So if you haven't done so already, go apply the patch now according to the instructions supplied in the Tips and conventions section at the start of this guide. You have been warned! The old folk of legend need no circles. Ssssss. Sssssss. This majestic creature has no venom." Deep, deep, deep into the darkness. These rocky walls hide Saxton's secrets. Some hear her song, some hear the drip, drip, drip of ancient waters, while others will hear nothing at all." So... head for the caverns on the beach. As you enter, CLUE 6 blows into the caverns ahead of you. Just work your way to the back, and take the left fork to enter the tidal chamber. You get the same dialogue with the spirit as before, only this time you need to get a close-up of a rock on the bottom left of the screen. Use the photo of the Pasque Flowers on this rock, and you succeed in freeing the spirit in the tidal chamber (the spirit says that Ager promised her these flowers). Then use your camera to take a photo of the tidal pool symbol that appears, and of course we'll have to look it up later. You have completed the May Day TREASURE HUNT. Take this clue to Nanny Noah's stall to receive your Fayre Tokens. No Tokens for you my boy. You are only testing my treasure hunt, after all. Pop by The Ark, later this afternoon. I have something to show you. NN"
As you leave the caverns, Nigel spots Hardacre heading off somewhere. So follow him. Now you can finally access some places beyond the tidal cave (before this, it was always "Sharp rocks", and you couldn't go there). Take the path to the southwest, and you come up behind Hardacre as he's peering through a surveyor's instrument (theodolite). Speak to him, and from this conversation you get the idea that you need to find a crank handle somewhere to operate a bell. So wander around until you find the bell, then go past that and look for a pile of ropes (during your wanders, you may find a picture, in a box of stinky fish, that someone has taken of Nigel from behind. Don't know if this is important or not). Anyway... access this pile of ropes that you found several times until you have uncovered the crank handle, and can put it in your inventory. Use it on the bell to operate it. Go back to the cove where the rocks echo, and Nigel gets a vision of the battle helm. Can't make out what the voice in the vision is saying though. When Hardacre hears the bell, he leaves the thedolite to investigate. This is your chance to sneak back to the theodolite and have a look through it. You can rotate it using the numbers at the bottom. In the +135 view, you spot Lucy up by the old net hut. Just then, Hardacre returns. As Nigel leaves the scene, Lucy contacts you on the walkie-talkie. Just access your walkie-talkie in inventory to speak with her. Nigel then walks up to the net hut. Lucy wants to get inside the hut, but there's no door handle. So go down the steps and have a look around. You can't find anything useful. Then go back up to the top of the stairs, and examine the cliff. You find the blood on a rock that Lucy spotted earlier. Then speak to Lucy again, and give her your camcorder. When you go back downstairs, you can hear Lucy breaking in up above. Then the shutter mysteriously closes over the window, and we're in the dark. Tell Lucy to open the LCD cover on the camcorder to operate it. Now she can see you, and can guide you through the junk. Have Lucy manoeuver Nigel around the obstacles, and then... one of those nasty wraiths materialises in front of him. So now guide him back to where he originally was, and the wraith moves there to block his path again. Head back the other way, and the wraith disappears... temporarily, but then heads for Lucy on the balcony. Have Lucy run to the other side of the balcony. Now guide Nigel around the boat (you have to go under the balcony), and towards the northwest corner of the basement. The wraith follows him. But near the northwest corner you can examine the scene more closely. There you will find a handle that reopens the window shutter, and the wraith finally disappears. Examine the barrel with the oil cans on top, and you find the collar of Mr. Tibbs, Rhys' missing cat! Now Nigel can head down the ramp in front of him, and undo the latch on the door. It swings ominously open. Enter, and... oh dear! The missing cats are hanging there, having been skinned. There are photos of Nigel and Lucy on the wall. Behind the photo on the top left, you find a small red key. Then advance to the left. There's that nasty portrait of the Ager brothers on the wall above the desk there. The bookshelf contains some grisly anatomy books. The remains of a cat are on the desk. Examine the drawers on the left of the desk, then use the small red key to open the middle one. You see a bloody scythe atop two books. Just then, something locks the door behind Nigel, and Nigel is beset upon by a swarm of flies and panics. Walk back to the door, and Nigel calls out to Lucy. Use the walkie-talkie then to tell Lucy to open the door. She kicks it in. Now you can investigate further at your leisure. When you go back to look at the drawer, the scythe is no longer there. Hmm. Reading the two journals there seems to imply that one of the Ager brothers is still alive! But how can that be? Or is it someone else carrying on their work? When you look at the portrait again, it has changed. Two of the figures now have cracked faces. And now on the bookshelf... you find Frederick Ager's Journal. Seems as if he's set himself the task of guarding the remaining Lost Crown. Now return to Lucy, and speak with her. You have two new topics: the journal, and the fact that the painting has changed. You and Lucy finally conclude that this is a matter for the police. You speak to her outside then, and discover that Alex Spitmoor (an anagram of Impostor) is actually Lucy's brother, and is a police detective investigating the missing cats. Lucy then packs you off to Nanny Noah's, while she goes to inform Alex of the latest developments. You have to form a sentence with the words from different areas of the screen. This one pissed me off quite a bit :- It sounds like when you click on the middle of the scene it says "we". So I was looking to form something like: "We (are the) evil which (lives in) the walls." But it turns out that what sounds like "we" is actually meant to be "within"?! Pretty lame. So you have to trace out: "Evil which lives within the walls." I'll leave it to you to figure out which part of the screen to hit in which order. Mightily peeved I was after trying this at least two dozen times before I figured out what the problem was! Go to the end of the hall first. From Lucy's viewpoint, you see a wraith in the kitchen, then a figure appears briefly behind Nigel. To the bathroom next. You hear Christina crying, and a spectral form appears. Now to the bedroom. The closet doors open, and the drawers open and close. Finally, head out to the balcony. You get a good image of Molina hanging himself. Lucy asks Nigel to capture it on film, but Nigel says he has a better idea... you can get a voice recording of Molina now. When you play it back, you hear the numbers: 3... 4... 1... 8. Yourself and Lucy decide to sleep on it. You can go deposit the latest evidence on the table, then your Hadden Industries gadgets on the window sill, then hit the sack. You dream the scythe/picture of the Ager brothers dream, only this time Nigel takes the place of one of the Ager brothers in the picture. Then you wake abruptly, and Nigel says there is something wrong... with time. Indeed things are looking a bit... foggy. You can start off by speaking to Bob Tawny, who has set up camp at the base of the stairs. If you noted earlier that poor Cairin the pig had disappeared from his stall, now you know what became of him :- Head to the left and speak to Lucy next. You agree to meet her later on in The Bear, when the results of the Saxton Snappers competition will be announced. Keep heading left and go in to see 'Mystic Morgan'. You suspect it might be The Bear's landlady, but no way to be sure. You can't do anything here yet though, as she expects payment up front for her services. You can try getting into the church tower, but the wooden door is locked. So continue on to the west, and you come to an archway. There is a door here that you can enter. Once inside, head to the southwest, and you come upon a young girl named Nancy. As you speak to her, Nigel begins to suspect that he is speaking to a ghost. This suspicion is confirmed when you learn that she is waiting for her father to return from the war - World War II, that is! Anyway... she's playing hide and seek with her brother Timmy. 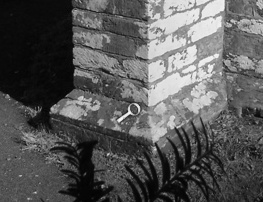 If you can solve a riddle on a slab out in the graveyard for Timmy, he'll tell you where the key to unlock the church tower is located. You might as well explore the church a bit further. You find a pipe organ, and up that aisle you can examine the ends of some pews, and get a photo of a carved seahorse. Under the pews there is a loaded mousetrap, but you can't do anything with it at the moment. "Deos lyft byred lytle wihte." Translation: "The wind carries small creatures." "Ofer beorghleoa pa sind blace swipe." Translation: "Over hill-slopes and headlands: dark." Translation: "Coated, black-bodied. Bursting with song." Translation: "They chirm and clamor like a troop on wing." Translation: "Winding their way to wooded cliff-walls." "Nippa bearna. Nemnad hy sylfe." Translation: "Sometimes to the halls of men-singing a name-song." Well, now at least you have a translated riddle. Go speak to Timmy again. You read him the first part of the riddle, then use the translated riddle on him, and he reads the second part to you. Together you work it out. It's referring to the birds that nest in the church tower. Answer him correctly that they are sparrows, and you've got yourself one key to the Ulcombe Tower. So let's go there then! There's a machine straight ahead of you as you enter. Upon examination, looks like it needs some fuel in order to function. Head down the ramp into the basement of the tower, and pick up the rusted metal valve at the base of the ramp. Have a look at the locked door while you're there. Hmm. Requires a combination. Also note the pipe that runs into the top of the door. There you discover another crown book (turns out to be Nathaniel Ager's Journal), and a can of oil, half full. Use the can of oil on the machine in the tower, then push the top button to start it up, and now you have a power source for the pipe organ and the crypt door! the frightful face of death that night..."
the startled hermit tried to hide..."
as the peasant crossed the fenland sand..."
Concentrate on getting the left and right-hand panels in the correct positions, as above. Then when you rotate the middle one to the position shown, the panels in the wall behind you will open ;-) You can enter this secret room, but a wraith blocks your access to the tomb within. Hmm. We'll need to find a way to get rid of that! Once you play the correct combination of keys, you have succeeded in freeing Ulcombe Church of its dead! Now return to the crypt, and you can visit the tomb of Nathaniel Ager. 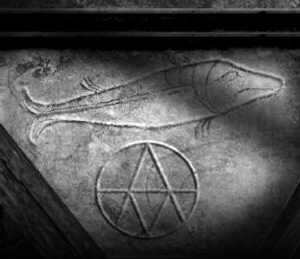 You come away with a photo of the symbol above Nathaniel Ager's tomb. Now exit the crypt. On the way out, Russet bids you farewell from above. And then after leaving the tower... you come upon Rhys' cat, Mr. Tibbs! Now we need to find a way to make him follow you home. Hey wait... go use the candle stand on the baited mousetrap under the pews in the central aisle of the church. You obtain a wedge of Stilton Cheese. Use this on Mr. Tibbs to get him to follow you. Every time he stops, just use the cheese again to entice him further. Finally, you both end up in the Celtic corner for a cheerful reunion. While you're there, might as well pop that last photo into the competition box, and look up the latest Anglo-Saxon symbol. It turns out to be the symbol for a hill. "Beneath the town... through the Eye... beyond (through) the fens... beneath the hill." Now at the second monolith, you can head south on a path that brings you down into an old mine. Examine the barrels inside the cave entrance, and you find a metal plunger there amongst the cobwebs. Now head to the east, and take some sweaty gelignite from the box under the makeshift table. Examine one of the scrolls there (all four read exactly the same), and it tells of a 'final rock wall' somewhere in the mine, that the men were afraid to blast through due to 'knockers'. Hmm. Well the 'knockers' aren't going to stop us, are they? Enter the mine proper next, and you come upon this rock wall, immediately to your left. Place the gelignite on the rocks by the wire, then go back to the table and use the metal plunger on the device there and... kablooie! No more rock wall. Head back inside, and through the freshly opened hole in the wall. You find the journal of one Alistair Farleigh there. You can't take it, but be sure to read it. It's important information... hmm. Seems like whatever malevolent presence is guarding the mine eventually got the better of him. We'll have to be careful. Continue forward and you come to a chasm with a rope bridge over it. Ominously, the torches in this area all come alight as you approach. Creepy. Examine the mural on the wall there, and Nigel walks onto the bridge to get a closer look. You can get a recording of whistling, tonal wind noises here. Then you can continue across the bridge. And now we have our third mysterious disk. Then head back to the hallway again, and this time go to the right at the T-junction by the clockwork mechanism. Once you've arranged those correctly, the wraith dissipates. Now you can examine the centre of the room. Hmm. Looks like we'll need to locate one more of those mysterious disks before we can proceed further. 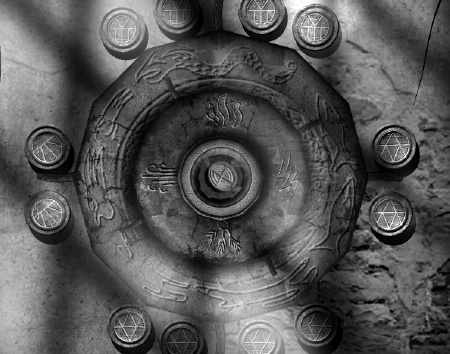 Then the centre of the stone wheel opens, allowing you to recover a fourth mysterious disk. Time to return to the large circular room and put them to use. The disks will only go into the holes in a certain way, so don't worry too much about placing them. Now... at the outset, this looks a right mess; a real complicated puzzle that could take you hours of twiddling to solve, right? But looks can be deceiving, and it's actually quite simple if you apply the right technique. So... the first trick is to replace those complicated symbols with letters, so that it's easier to see what's really going down. 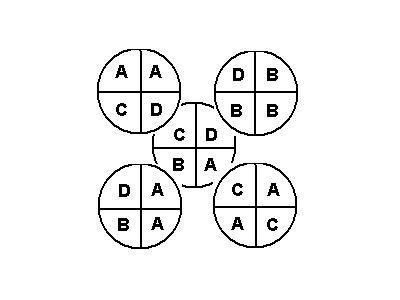 The second trick revolves around trying to solve the puzzle, no matter how futile you find this effort to be. You learn a very important fact here: no matter how badly you mess up, the puzzle resets itself after five moves. From that we can infer that five moves are all that's necessary to solve the puzzle. Fortunately, Lucy has nicked Mystic Morgan's crystal ball, and reluctantly you agree employ it to find the missing crown. 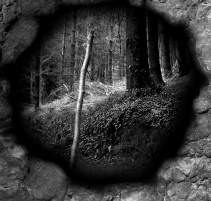 Through the crystal ball, you witness what looks like Professor Hardacre being chased across the rocks and beaten to death with a scythe... and that brings an end to today's mysterious proceedings. "Killer, killer they saw what you did. Old Grindle's tail keeps me well hid. EG"
Hmm. The initials EG. Not sure who that could be. Anyway, let's head outside, and see what we can find. As soon as you exit the cottage, you hear a dog barking. So head for the beach, and through the Eye. Sure enough, as you approach the Pinnacles, you see the characteristic police tape denoting a crime scene. Speak to Nanny Noah then... and she refuses to speak to you, like she doesn't even know you! Then speak to the constable there, and you get referred to Lucy's brother, Alex Reubans. Well, it's Hardacre that's been murdered alright. Nothing you can do but keep out of the way. Hmm. Professor Oogle refuses to speak to you at the museum, and the same with Bob Tawny. It's almost like you never existed, in their eyes. Nothing more we can do, I suppose, than head back to the cottage to try to piece things together. When you head up to the bedroom, you find that the place has been put back together... in a certain sense. The crown is still missing from the chest, and all your photos and tapes have been erased! What's going on? After leaving Alex, you emerge at the Fenland Eye. Head all the way to the east, and beyond a constable there, you can examine Hardacre's boots, and take a photo of Hardacre's boots. Then keep walking around, and compare this photo to all the other footprints you find in the sand. Eventually... just to the southwest of the old bell, by some lobster pots, you find one of Hardacre's footprints. As you pull out of the close-up, Nigel sees Hardacre's ghost. It's pointing somewhere to the left of there. If you examine that area, you can pick up The Lost Crown (again!) from a pile of old ropes. Nigel then returns to where Lucy is sitting, on the pier beside your cottage. 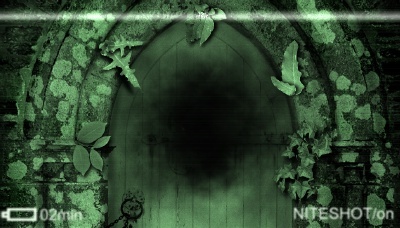 Speak to Lucy, and Nigel suggests that they put an end to all this by holding a séance at midnight in the cottage. Lucy agrees. Now go back into the cottage and head for the safe. Put the crown into the safe, and as you turn to leave... Christina's ghost blocks your path! Look down into the stagnant water by the blocked up archway, and retrieve some of Christina's diary pages. Aha. It would seem that our dear Molina was not the kind-hearted soul we had assumed him to be. Something sinister was going on, and it has to do with the windmill carvings at the foot and top of the stairs, and a space under the bed. Hmm. See the metzomagic.com Review of The Lost Crown. Copyright © Steve Metzler 2008. All rights reserved.